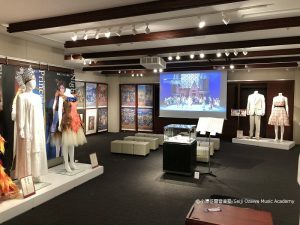 To celebrate the Seiji Ozawa Music Academy Opera Project XVII, “Seiji Ozawa Music Academy Exhibition 2019” has opened last December at ROHM Theatre Kyoto Music Salon. We are happy to announce that the second part of the exhibition opened today until March 29 (Fri)! 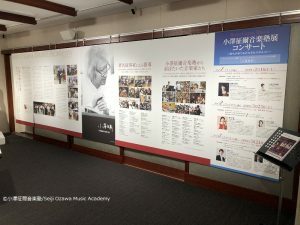 The theme of the Part 2 is “History of Seiji Ozawa Music Academy”. You can enjoy beautiful pictures from previous productions, special article written by former executive producer at the Academy, and great list of our top-class teachers and graduates. 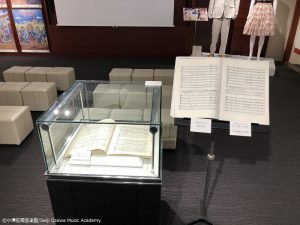 One of the main features is the original score of Seiji Ozawa. You can take a look of his handwriting memos on scores to understand what’s in his mind when he conducts. Also in total 7 pieces of wardrobes from previous operas would glam up the exhibition. On a wide screen at the venue, we will play about 1 hour length video collection of 2000 – 2018 productions. The world famous opera singers such as Christine Goerke, Mariusz Kwiecien and Anna Netrebko are on the screen as well. Please drop by at the entrance free exhibition.